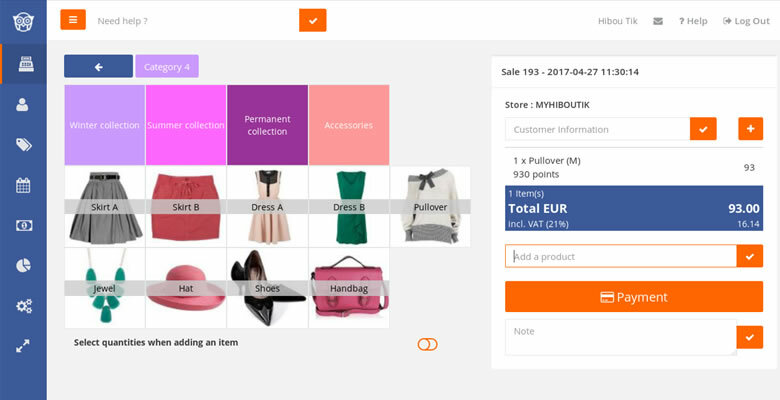 In this article, we will explain how you can use Hiboutik POS software to manage sales and track inventory in a clothing store. – or use quick keys in the left side of your sale interface. For quick keys, it is important to categorize your items in a way that makes sense to your business. 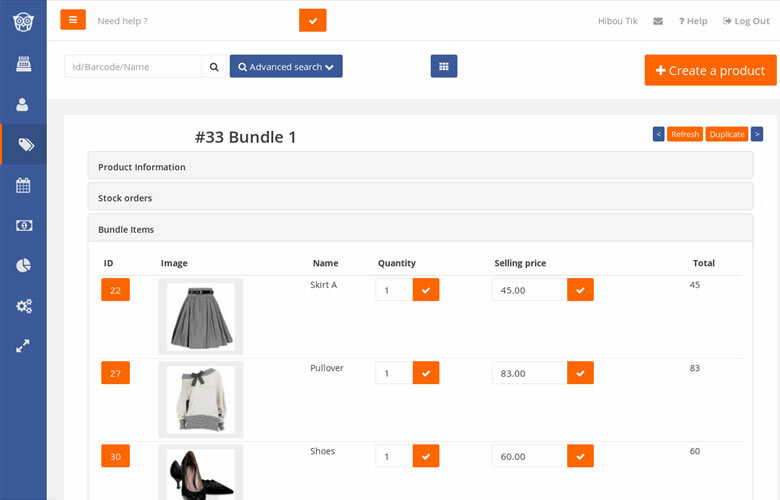 As an example, for your clothing store, you can choose to organize your products by collections, clothing types (skirts, shirts, sweaters…) or brands, or any other classification that is relevant to your business. You can create as many different categories and sub-categories as you want in Products/Product settings/Categories. In the Reports tab you can track sales by category, with an in-depth analysis of sales, margin and contribution of each category to total sales. You can also assign tags to your products in order to sort them with different criteria than your categories. Ex: you can link your products with collection periods in order to find out what is leftover from former collections. In the Products tab of your Hiboutik account, you can create your products. Products with no variant are easy to manage. You just need to link them to product categories, and add supply and selling prices. If your supplier provides barcodes for your products you can fulfilled them in each product form. That way you just have to scan them when a sale occurs. 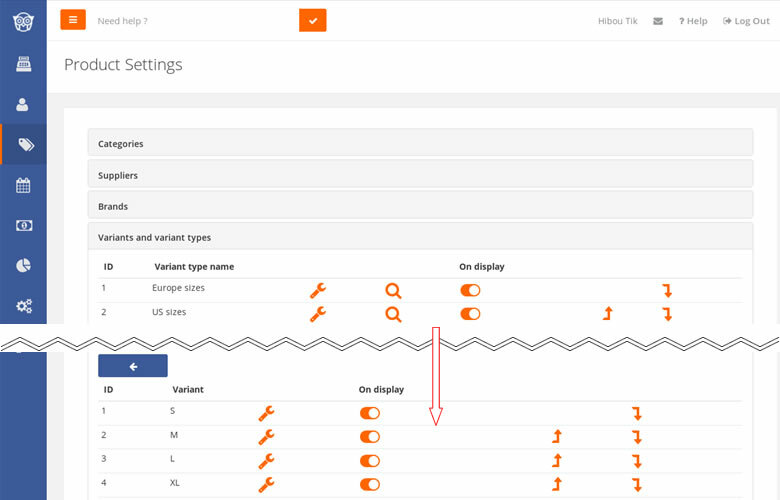 For products with variants (sizes, colors,…) we need to create variant types. In each product form you can link your product to a variant type, in order that Hiboutik understands that your product comes with attributes. In the “Barcodes and Prices by variant” tab of each product form, you can also manage your different prices and barcodes depending on the variant. Variants management avoids duplicating occurrences of the same product and helps tracking purchases and sales by variant. For each product, you can decide to track it or not into inventory. If you manage your product into stock, you must first create a stock order to start selling the product. It´s not always necessary to create a unique identifier for each item, especially when you receive few units and you cannot restock them. Therefore you can create generic products. Example: item “2014 Scarf” includes all 2014 winter season scarves. Once the product is added to a sale, you can select it to modify its price (if you are allowed). By using barcodes (in the “Barcodes and Prices by variant” tab of the product form), you can set multiple prices for the same generic product. If you leave blank the supply price in the product form, you can set up your account to display a price pad when the product is added to a sale. A bundle product allows you to package different products together (ex: blouse + skirt + shoes), in order to propose a a more appealing price than selling each item separately. To create a bundle product, you must create a new product and select it as a composite product (you will need to enable the bundle product right in Settings/Users/Access Management). Then you must add the different items included into the bundle, and change their prices in order to reach the bundle selling price. When you sell a composite product, the stock of each item composing the bundle is updated. If one of the items included into the package is no more available, you will not be able to add the bundle product to a sale. You can also add packs that are made up of a number of the same product (ex: 5 pairs of socks for the price of 4). If you scan your products you can accelerate your sale process and avoid mistakes when products are added to a sale. If you are using a ZPL compatible printer, you can print automatically your product labels from your Hiboutik account. In Products/Product settings/Labels, you can set up your own label layout or use existing templates. When receiving new products, you can print the exact number of labels required for storing them. In each product form you can also print your labels for the different variants of the product. So labeling products helps identifying quickly each item, which turn out to spending more time on customer service. 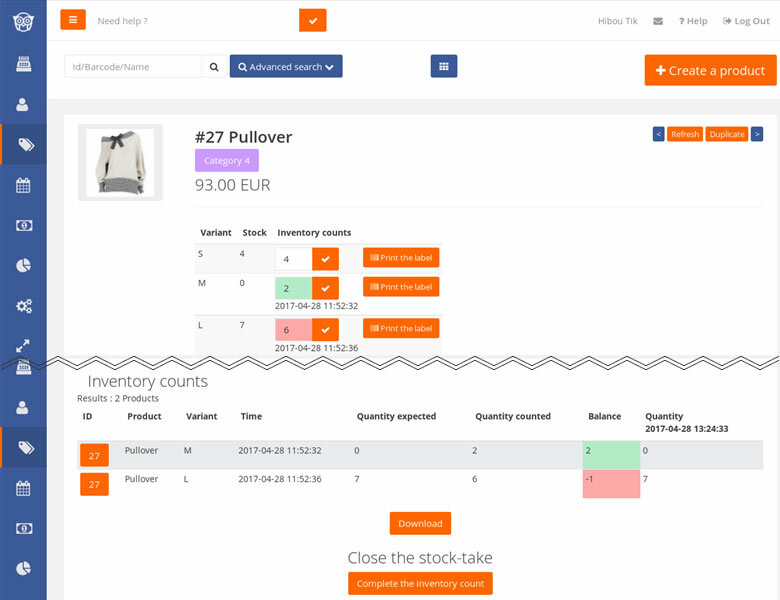 If you need to refill your shop from your warehouse, Hiboutik can display a list of products to restock according to the last sales and inventory levels. You can associate any product to a location within your warehouse, so you can easily find it in a few seconds. With this feature you will not waste time organizing the shop after each day of sale. You will be sure that the products in inventory are actually in our shop. On each product form, you can set a discount price to be applied during sales periods. You can set your sale event period in Settings/Sales period. At the start date of the sale event, the discount price can be applied until the last day of the sales. You can easily update your discounts prices with a bulk import CSV file. Please read the article explaining how to update prices. For products manage into inventory, you can complete inventory counts in your Hiboutik account. You can easily check expected stock for each product and write down discrepancies with counted quantities. When you close an inventory count, Hiboutik updates all differences found in your stock. With this feature, you will not need again to wait until the last day of the year to make a stock-take. In the stock report, you will find a true and accurate valuation of your inventory at any date of the year. Know more about the inventory counts feature. Hiboutik includes many more features for advanced customer relationship management (CRM) like loyalty programs. Hiboutik POS software is designed in a simple and adaptable manner to fit a clothing store needs. Within minutes you can create your own, go ahead!